The KX-TA824 Panasonic Small Business Phone System is designed to streamline office or home communications by organizing your phone lines into a cohesive phone system and making a host of advanced features available to each extension. 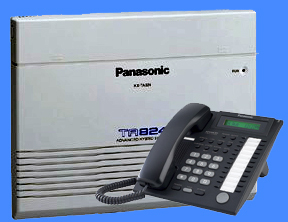 The kx-ta824 Panasonic Small Business Phone System provides out of the box interface for 3 lines in X 8 telephones with either KX-T7700 series or KX-T7000 series proprietary phones or analog single line telephones, fax machines and cordless phones with expansion to 8 lines in X 24 telephones with either KX-T7700 or KX-T7000 proprietary phones or analog single line telephones, fax machines and cordless phones. The term Hybrid is used on the KX-TA824 for the station or telephone ports. A user can connect either proprietary telephones or analog telephones such as single line phones, fax machines, and cordless phones. One way the Panasonic KX-TA824 business phone system can save you money every month is: use a Pfax line for your inbound faxing and plug a fax machine into one of the Hybrid extension lines. That way you will have all of your inbound faxes through Pfax into your email and all of your outbound faxes will be sent out of your regular phone lines. The Panasonic KX-TA824 business phone system automatically answer all of your phone calls and route the callers to there destination 24 hours a day 365 days a year. The free auto answer feature will not ring the phones than answer the phone. Assign specific lines to each business phone, make intercom calls, forward your calls to an extension an outside location, monitor a room, page all system extension phones and more, all through the Panasonic KX-TA824 Advanced Hybrid Phone System. Panasonic KX-TA824 Advanced Hybrid Telephones. Panasonic Door Phones & Opener Cards. Affordable door phones that utilize a door opener card that will trigger either a electric gate or a door striker. Affordably priced headsets that work with the T7700 series telephones. The headsets connect to the T7700 series phones with a 2.5mm headset jack that will also work with most Cell Phones. What is involved in installing the Panasonic KX-TA824 Phone System? If you subscribe to phone company voice mail service the user's voice mail messages can be stores in their voice mail box at the phone company's central office. Each outside line can be assigned it's own out side line voice mail box. When a voice mail message is left on any one of the out side lines the large message waiting LED light will plash on each systems phone and the associated outside line button will also flash. By simply pressing the flashing outside line button and the message button on any extension the user can access their messages at any time. You can choose the central office (CO) line buttons on each proprietary telephone to access a CO line or you can program them for one touch operation of system features like intercom calling, speed dialing, or paging.